This volume explores the varieties of relationships formed between science and civil society, at both the conceptual and institutional levels, since the late seventeenth century. It brings together general historians and historians of science with different national perspectives to confront the various ways sin which science and civil society have shaped one another in different times and places. How, when, and why did science become intertwined in the network of voluntary associations, professional groups and other institutions we understand as comprising “civil society”? How has science affected the ideology of civil society and thus the legitimacy of political authority in historical contexts as different as late eighteenth-century America, mid nineteenth-century Germany, and early twentieth-century China? How have scientists made use of the ideological links between science and civil political discourse to further their own professional ends? In contrast to much recent writing on civil society, this volume does not aim at making normative pronouncements about the role of civil society in promoting democratic polities, nor does it attempt to weigh the role of science in democracy. 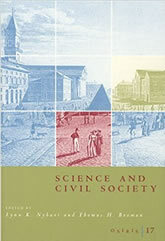 Instead, the essays examine how the fruitful interplay of beliefs concerning science and civil society has worked to legitimize the institutional forms of civil society and naturalize its ideologies, while at the same time giving to science its overwhelmingly powerful role in public life.